TBEAEI has successfully executed the project despite numerous natural challenges and the 400/132kV Switchyard at Motihari (Bihar) is fully operational. The switchyard will cater the power supply and distribution to the power starved districts of East Champaran and neighbouring districts of North Bihar. This achievement deserves many applauds. 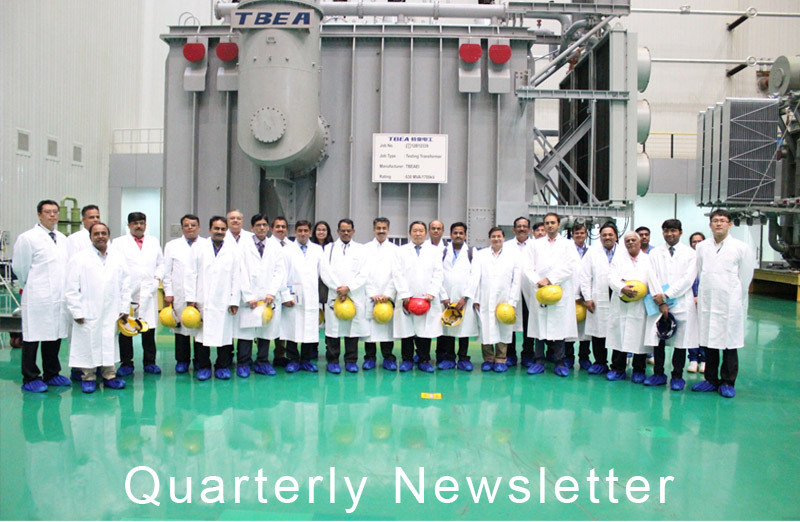 Another proud moment for TBEAEI comes from the successful synchronization of 800 MW Unit 1 NTPC Lara Super Thermal Power Plant. Congratulations to the entire team for their successful performance. 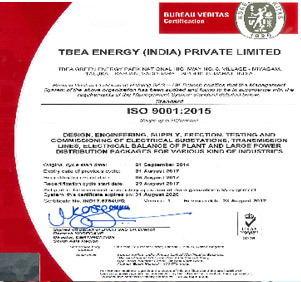 In yet another remarkable achievement, TBEAEI has received QMS ISO 9001: 2015 certificate. This is definitely a moment of encouragement for all those who work very hard to ensure quality parameters in all respects. This is indeed a huge leap for TBEAEI in terms of its quality commitments. 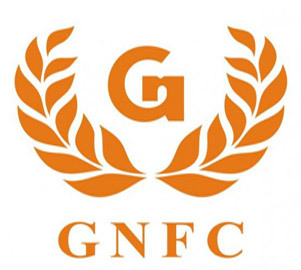 In a first of its kind, the distribution transformers segment of TBEAEI has qualified itself for registration with GNFC, a premium PSU of Gujarat. 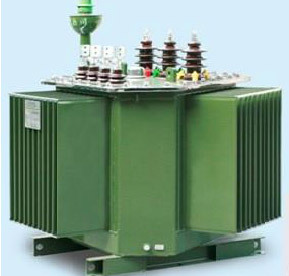 The product categories that passed through are oil immersed distribution transformers raging 11 kV, 3.3 kV and 0.433 kV. For the enhancement of DT business and for promoting the green technology of transformers i.e. 3D wound core, technical presentations were given to BSES (Reliance Power), ACME (Solar Developer), ABB, G.E, TPDDL. These efforts have resulted into requirement and purchase enquiry to the tune of Rs. 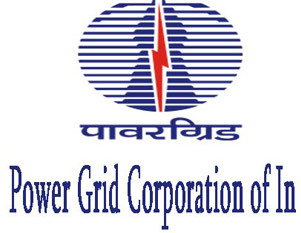 40 Crores for the distribution transformer segment from these reputed organizations. TBEAEI has received LOI for 4 Nos. 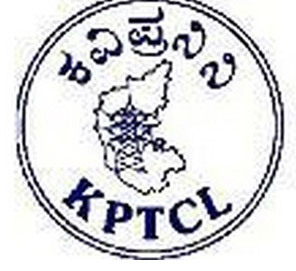 100 MVA, 220/66/11 KV Power Transformers from KPTCL, Karnataka. Of these 2 (two) orders are direct and 2 (two) are indirect. This is the first major breakthrough from KPTCL (major state utility in Southern Region) in 220 KV Voltage class and quite significant from the competition point of view in 220 KV class segment apart from the entry in KPTCL. PGCIL has awarded us the Transformer & Reactor Package for Medinipur-Jeerat (ERSS-XVIII) under TBCB for the following scope: (i)14 Nos. 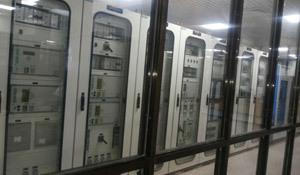 500 MVA, 765 KV ICT; (ii) 14 Nos. 80 MVAr, 765 KV Reactor; (iii) 14 Nos. 110 MVAr, 765 KV Reactor; (iv) 4 Nos. 125 MVAr and (v) 400 KV Reactor. 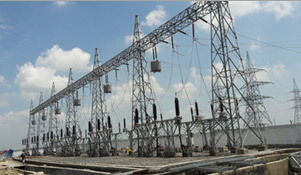 This is the first highest ever contract from PGCIL to TBEAEI under single Transmission line. TBEAEI has received LOA for 1 No. 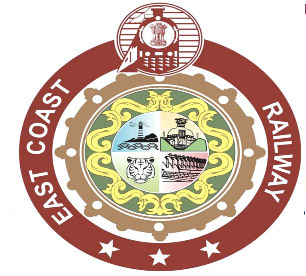 21.6/30.24 MVA, 132 KV Transformer from East Coast Railway, Bhubaneshwar. 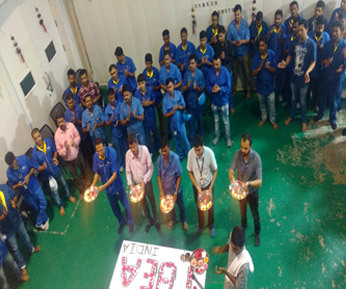 This is the first Direct order from Railways and significant from the competition point of view in 132 KV class segment. 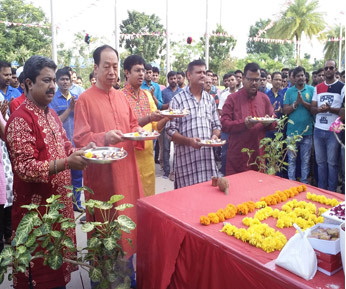 Festivities are part of every Indian life and TBEAEI culture too. And here are few glimpses of the Ganapati Aaradhana and the Garba that took place in TBEAEI. 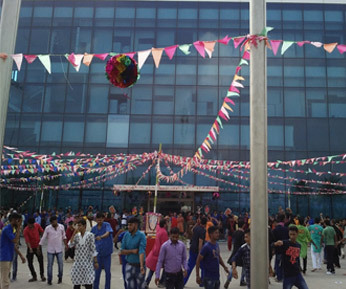 Employees across the organization participated in the festivity with full enthusiasm. 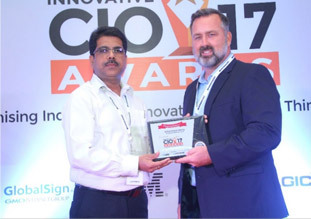 TBEA has the "Innovative CIO"
Successfully scuttling the benchmarks of (i) Innovative Communicator; (ii) Innovative Management Capability; (iii) IT Innovations to drive Business Growth; and (iv) Innovations to Transform, Mr. Ashok Verma, IT Head of TBEAEI has been honoured the "Innovative CIO" award for the year 2017. This is a great honour to TBEAEI besides a great value addition. TBEAEI extends hearty congratulations to Mr. Ashok Verma for this outstanding achievement. Nazneen Kachwala, Sr. 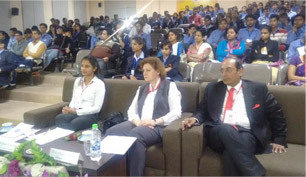 Engineer from Single Product Design, participated in an International Conference conducted by the BRICS Nations at the Mandsaur University, Madhya Pradesh that holds the only UNESCO chair in India, in February, 2017. Her paper entitled 'Youth Empowerment through Education – Case Study' was selected for the conference and was widely appreciated. 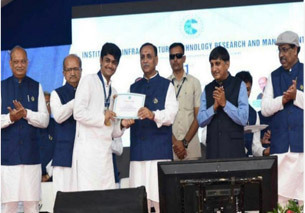 Kirtan Doshi, GET in TBEA, was awarded the degree during the convocation program at IITRAM from the hands of Honourable Chief Minister Shri Vijay Rupani and in presence of ISRO director, Mr. Tapan Mishra and Honorable Minister, Shri Bhupendrasinh Chudasma. 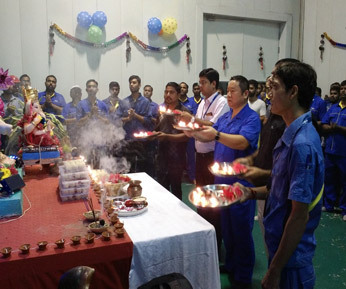 Kirtan was also honoured with a Gold Medal for electrical department's highest scorer as well as "University Topper". Apart from this Kirtan was also awarded another Gold Medal known as the "Chairman's Medal" as star student of the batch. 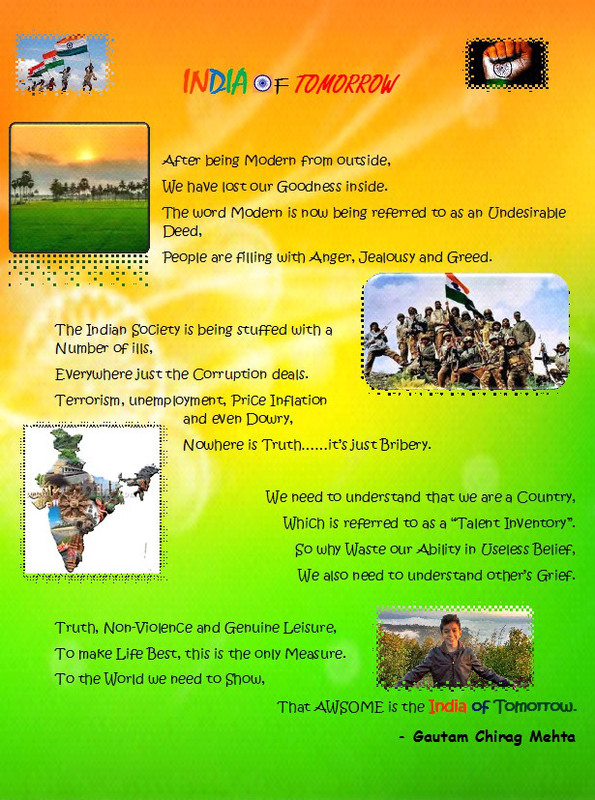 Gautam Chirag Mehta, son of TBEA's employee Finance Department's employee Mr. Chirag Mehta sums up the India in our eyes at present and the India in our dreams through his beautiful poem called India of Tomorrow. * Prepared, reviewed and edited by Abhirup Ghosh.